The RMS Titanic sank in the icy waters of the Atlantic on April 15, 1912. Today, we're looking at A Night to Remember (1958), one of the best films about the doomed ocean liner. The sinking of the Titanic in the early mornings hours of April 15, 1912, was one of history's great maritime tragedies and the Titanic's fate has been a source of public fascination ever since. Newsreel footage of the ocean liner was popular in early movie theaters, and there are several films and television shows about the tragedy, including the 1997 blockbuster Titanic; a 1953 melodrama starring Barbara Stanwyck, Clifton Webb, and Robert Wagner; The Unsinkable Molly Brown (1964), a musical starring Debbie Reynolds as a feisty American widow, and even a 1943 German propaganda film that showed a completely fictional German first officer trying to save the Titanic from the greedy British (Nazi Propaganda Minister Joseph Goebbels hanged the director midway through filming for complaining about the drunken behavior of the German Naval officers who were technical advisers on the film). Second Officer Charles Lightoller (Kenneth More) jokes with first-class passengers in A Night to Remember (1958). Most historians and critics believe the best film about the Titanic is A Night to Remember. The film is based on Walter Lord's meticulously researched 1955 book. Lord interviewed 63 survivors and amassed a huge archive of papers that helped him reconstruct an accurate minute-by-minute account of the disaster. Producer Walter MacQuitty quickly acquired the rights to A Night to Remember for Britain's Rank Organization. MacQuitty grew up in Belfast near the shipyards where the Titanic was built and he watched the Titanic launch on its maiden voyage when he was 6 years old. MacQuitty hired screenwriter Eric Ambler and director Roy Ward Baker to craft a film that would focus on what really happened on the night of April 15. 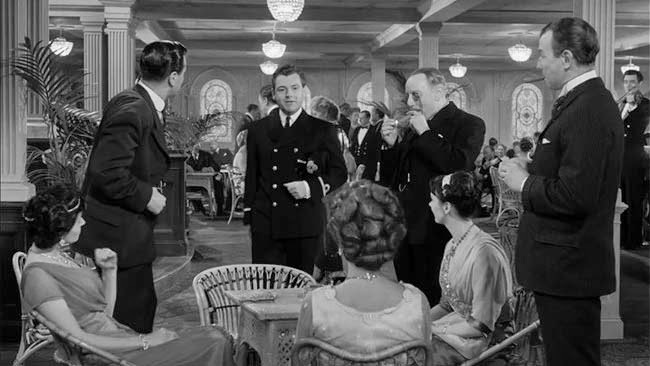 There are no fictional characters in A Night to Remember: All of the 200 speaking parts in the film are real people who were on board the Titanic that night, representing everyone from Captain Edward Smith (Laurence Naismith) to Charles Joughin (George Rose), a lowly baker who rode out the ship's final moments on a deck chair after downing a bottle of whisky. 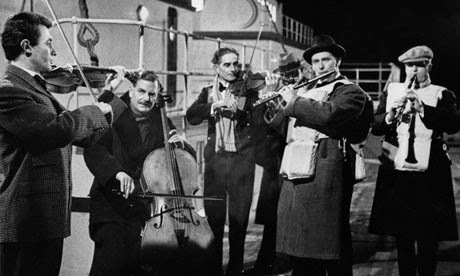 The Titanic's band played during the ship's final hours. A Night to Remember is an ensemble drama, but Kenneth More, playing Second Officer Charles Herbert Lightoller, has the largest part in the film. Lightoller was the highest ranking crew member to survive, and Lord based large portions of his book on Lightoller's recollections. He is the key witness to Captain Smith's reaction to the iceberg and to the chaotic scene that occurred while loading the lifeboats. 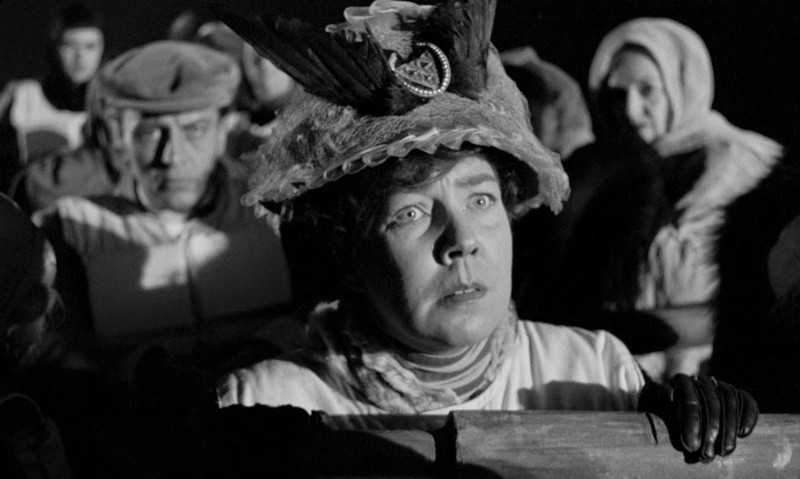 Margaret Brown (Tucker McGuire), aka The Unsinkable Molly Brown, watches the Titanic sink in A Night to Remember (1958). A Night to Remember had a limited budget and the Pinewood Studios didn't have a large enough water tank to film the scenes where survivors scramble onto an overturned lifeboat, so MacQuitty rented an outdoor pool in the London suburb of Ruislip at 2 am on a November morning. More did not remember the experience fondly. "Never have I experienced such cold in my life," he remembered in his autobiography. "It was like jumping into a deep freeze." Several Titanic survivors served as technical advisers on the film, including Fourth Officer Joseph Boxhall, who was played by Jack Watling. Passenger Edith Rosenbaum Russell also served as an adviser and she brought along her toy pig, a good-luck charm that Russell carried onto a lifeboat. Russell brought the pig to the set of A Night to Remember, and actress Teresa Thorne carries it with her in the film. 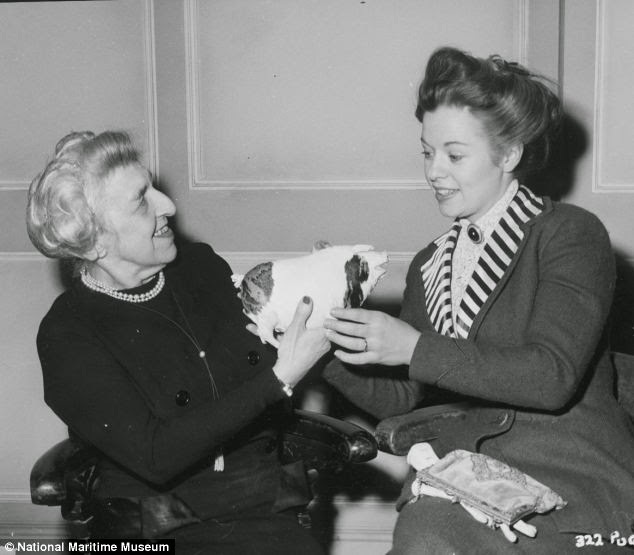 Titanic passenger Edith Rosenbaum Russell (left) carried a toy pig onto a lifeboat. Russell loaned the pig to the makers of A Night to Remember (1958). Here she's showing it off to actress Teresa Thorne, who played Russell in the film. A Night to Remember was well-received by the public and critics and it gained renewed popularity after frequent showing on AMC in the 1990s. The Criterion Collection has a handsome DVD and blu-ray edition, which includes a 60-minute documentary about the making of A Night to Remember and several features on the history of the Titanic. A Night to Remember is also available on video on demand. Below is a clip of the film's London premiere, featuring comments from Titanic survivors.